Lisa is Busy Nerding: Bring it, 2013. So obviously I've got a lot cookin in 2013 what with having a new life that I'm completely responsible for taking care of, but that doesn't mean my bookish loves will go away completely! Plus I've got like 5 good months of reading before bebe comes...that's something. Right? Right?! Anyway. I'm scaling back on the challenges since I will be having the baby in May, but I'm still going to set some goals for myself! You all can lol forever at me when I fail miserably. That's okay. I can take it. +6 to be determined reads. Because I like to leave some things up in the air, okay? Let's be real. I've read a lot of first books in a series but then never get around to the second (or third) books. SO. This Sequel Challenge sounds pretty dang perfect for me. Especially because I can set the goal as whatever I want it to be! For the record, any book after the 1st one counts so HOLLA. I'm going with 13 sequels. Bitterblue by Kristen Cashore. (Book#3) Lucky for me, I'm already doing a readalong. Sneaky, huh? Frostbite, Shadow Kiss, Blood Promise, Spirit Bound , and Last Sacrifice by Richelle Mead. I plan on finishing VA in 2013! You heard it here first, folks. The Titan's Curse, The Battle of the Labyrinth, and The Last Olympian in the Percy Jackson series by Rick Riordan. PERCY JACKSON, Y'ALL. You guys, I have a box set of the first 7 books or something of this series and I still haven't read them all! I KNOW. I'm going to try and do the Level 1: Just A Drop challenge for this and read 1-4 of them. I've read through book #5, which just leaves two for me to read that are on my shelf. If I totally get smitten with them again, I may hit up le library for the rest. But, again, I need to pace myself! Since I'll totally need to be saving money for baby, this is a good challenge for me. Read what I have! AND I still have the rest of 2012 to sneak in some more books to my bookshelf. Mwahaha! 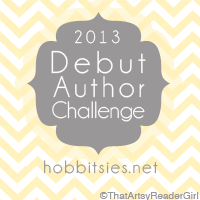 I'll be participating in this challenge at the A Sweet Kiss (21-30 Books) Level. I don't reread my books often enough. I just don't. I insist on buying them because I want to reread them and then new lovelies come into my life and...well. You know. This challenge is wide open with the expectations, which is wonderful because I'm feeling pretty specific about what I want to reread this coming year. I know. I'm probably really crazy. Even if I don't meet all of these challenges, I'm hoping to still read 50 books in 2013. Wish me luck! Are you doing any challenges? If so, please share! I'd love to see what else is out there and cheer you on! The Chronicles of Narnia is a great re-read--one of my favorite re-reads. I really should participate in the TBR challenge. . . such a good way to read those books I always mean to read! I'm still debating if I want to officially commit myself to it though. I don't do a whole lot of re-reading either, so that seems like a challenge maybe I should take on. Or maybe a "Tackle Your Own Bookshelf" challenge. That would be wise. (HA -- like I could really stay away from shiny new books.) 2013 has lots of awesomeness to look forward to! Happy New Year, Lisa! That's the thing! I want to give my own bookshelf the love but COME ON with the new and shiny books. How can we ever resist?! Huh. I went and took a look at the challenge site - that is COOL. I especially like that it's focused on Debut authors. I'll be keeping an eye on your blog for your reviews. I love learning about a great new author. I hope you find some great ones this year! I actually read a lot once I had the kid. Shhh!! The baby is sleeping. Yay for re-reading P&P. I've read it quite a few times, but not recently. I really should, though, because I have been kind of obsessed with The Lizzie Bennet Diaries. Thank you! And I am all about TLBD too. WOO! Also, pat Baby Nerd for me. Every year, I say I will curb the book buying. Yet every year...there are new books on the shelf. HOW?! I'm totally with you on the TBR pile reads. I feel bad for my poor pile of little, lost, forgotten books so I've dedicated much of my 2013 to playing "catch-up." There are also a lot of the classics that I want to read or re-read so I'm really hoping to kick it up a notch there too. Hopefully everything goes smoothly with the little one and you'll be able to catch some zzz's and knock out some of your reading pile. If not, there are always the movie versions of books!! (I have to give a nod to films sometimes, right?!). Happy New Year, Lisa! Welcome to the Sookie Stackhouse Reading Challenge! I hope you have fun reaching your goal! PERCY JACKSON YES! The Last Olympians will knock your socks off. Re-reads! Iron Fey! I want to re-read those guys too. Oh, all the feels. Re-reads forever. I just saw Pride and Prejudice and my heart did a crazy jig. YESSSSSSS!